Just a week ago, New Horizons made its historic flyby of Pluto and its five small moons (Charon, Styx, Nix, Kerberos, and Hydra). The pictures that the spacecraft returned so far are simply staggering (because the craft is so far away, it will take more than a year to receive all of the data). But already, we see that Charon is round and pockmarked. We see that pluto has a heart splashed across its surface. And there is something else that scientists recently discovered hiding behind Pluto. Saturn may have a glorious ring system, but Pluto has its own claim to fame: A plasma tail. 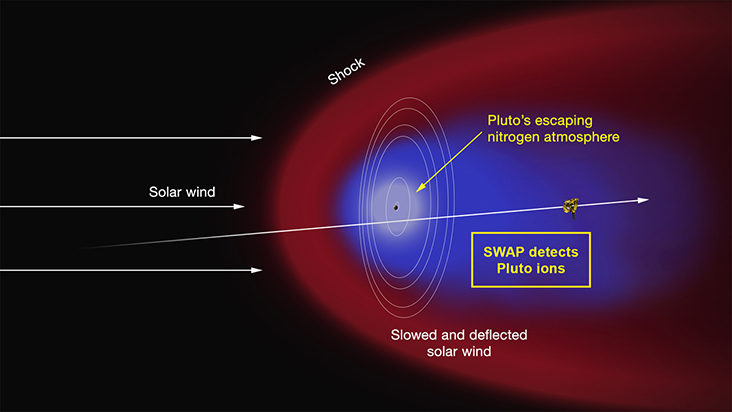 The news comes thanks to the SWAP instrument (Solar Wind Around Pluto). As it passed, the tool picked up readings showing a depression, and as it turns out, this depression is filled with nitrogen ions are lagging behind Pluto. Since the discovery is so recent, it is currently unknown exactly how large this tail is or what form its structure takes; however, further analysis of the data should allow scientists to uncover more information. So although we know the tail exists, we will have to wait until August to learn more, at which point New Horizons will send back the next data packet that will include relevant information about this particular feature. That said, at the present juncture, scientists think that the tail is caused by vulnerabilities in Pluto’s atmosphere as a result of solar wind added together with the fact that the world is so small. Ultimately, solar winds strip away rather massive portions of Pluto’s atmosphere, which then trails behind the tiny dwarf planet. To give you an idea of what this says about our sun, Pluto is 3.6 billion miles from the sun (5.9 billion km). That is nearly 40 times farther from the sun than Earth is. And our sun’s winds can impact worlds that are even this far away—That’s how enormous and powerful our star is. So ultimately, when we get the next package of data, scientists hope that we will be able to determine that exact rate of Pluto’s atmospheric loss. “Once we know that, we’ll be able to answer outstanding questions about the evolution of Pluto’s atmosphere and surface and determine to what extent Pluto’s solar wind interaction is like that of Mars,” said co-investigator Fran Bagenal, University of Colorado, Boulder, the lead researcher on this particular aspect of the study.